In the first of a series of offerings at August’s First Thursdays, Danny Kitchener reviews Close and Far, an exploration of place and identity in 21st century Russia, beautifully juxtaposed with the recovered works of Sergei Prokudin-Gorsky. Russia is the largest country in the world, and a land full of dramatic extremes and dramatic diversity. 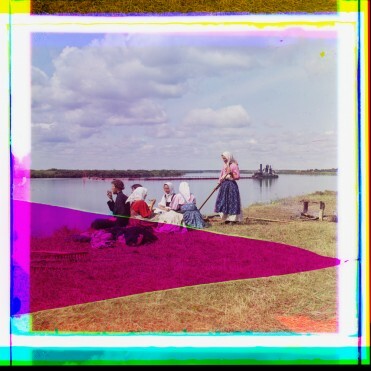 Alongside the recovered photographs of Sergei Prokudin-Gorsky, Calvert 22 Gallery is displaying the works of five prominent artists in Close and Far, exploring themes of place and identity. His colour images of pre-revolutionary Russia provide the blueprint for this exhibition, and also provide the context for the other contemporary artists work. The then Tsar commissioned Sergei Prokudin-Gorsky to make a visual record of his great Russia. Having to document different agendas, his photographs depict rural scenes, rolling landscapes and industrial growth. They look like something imagined – luscious rich greens, blue skies and stoic characters; but like a Grimm’s Fairy Tale, there’s a something unnerving going on. In one photograph a rich Chinese man, a foreman of a thriving tea plantation, exhibits and displays his fine clothes and dwellings in the manner of a peacock, while his migrant Greek workers labour away. Echoes of that economic divide are felt in present day Russia. 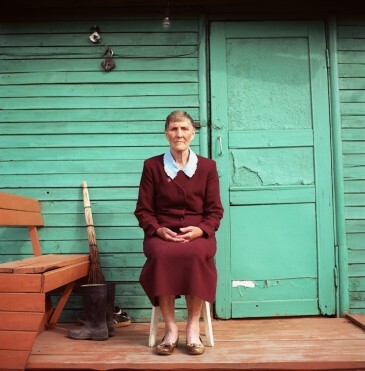 Alongside Sergei Prokudin-Gorsky’s photographs, Olya Ivanovo explores the traditional country life, or its decline within modern Russia. Stoic characters pose proudly, holding on to their traditional Russian heritage. With Moscow’s economic growth, the city’s boundaries are being pushed further away, eating away at Sergei Prokudin-Gorsky’s lush fertile landscape. These uninhabitable areas provide an unlikely escape for Moscow’s city dwellers, and this is what Alexander Gronsky’s photographs are exploring. These unlikely observations could be likened to those of English photographer Martin Parr. 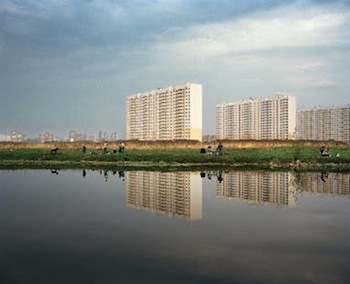 Although Sergei Prokudin-Gorsky was asked to document the growth within the landscape, Max Sher explores the opposite, particularly the repercussions of the Soviet Empire on the landscape. Dimitri Venkov and Taus Makhacheva’s work sits comfortably alongside the lens-based media on offer, more theatrical and performance based. Performances include Dimitri Venkov’s choreography executed in a now abandoned hilltop village; the movements explore the forgotten ruins of Russia’s past. Taus Makhacheva’s performance follows a more fictional narrative. It tells the story of a group living by the side of a Moscow road ring, surviving on debris and rubbish left my passers-by. There is no better place for this exhibition to be held, as the Calvert 22 Gallery is the UK’s only not-for-profit institution dedicated to exhibiting contemporary Russian and Eastern European art. This exhibition sees Calvert 22 join several other London institutions and galleries to celebrate the UK-Russia Year of Culture in 2014. The exhibition is well laid out; particularly the way in which the body of the contemporary artist’s work was wrapped around Sergei Prokudin-Gorsky’s work of the early 20th century. It provides context to the modern photography and highlights the weight of the issues and the questions being addressed. This entry was posted in Artists, Exhibition, Review, Uncategorized and tagged Art, Calvert 22, Culture, exhibition, London, london visual arts, LoVArts, photography, Review, Russia, visual art. Bookmark the permalink.